Once Again, Polls Show Attitudes Toward Guns Returning To Pre-shooting Levels : The Two-Way Immediately after previous shootings, polls shifted somewhat — then trended back toward earlier levels. A look at recent polls shows that happening again for the most part. 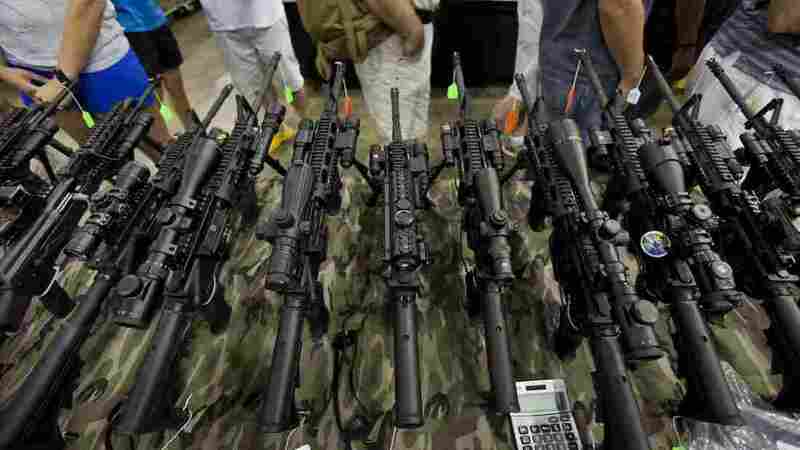 Guns on display at a show in Chantilly, Va., in July 2012. "The tragedy in Newtown, Conn., will surely spur pollsters to ask Americans again about guns, gun ownership, gun laws and the Second Amendment. "If recent experience is a good guide, public opinion may not shift too much." A week later, the Pew Research Center reported that "the public's attitudes toward gun control have shown only modest change in the wake of last week's deadly shooting." Then last week, a CBS News poll found that what had appeared to be at least a bit more support for stricter gun laws after the Newtown shootings had dropped since then. Now, with the Senate soon to vote on initiatives including expanded background checks of gun purchasers and increased penalties for gun trafficking, a scan through data from polls about gun laws underscores how attitudes for the most part seem to be close to pre-Newtown levels. -- That CNN/ORC polling done in January 2011 showed 71 percent agreeing there should be "some restrictions" on gun ownership. Last month, 70 percent said the same thing. -- That ABC News/Washington Post polling done in January 2011 showed 52 percent saying they favored stricter gun control laws, vs. 45 percent who said they did not. Right after the Newtown shootings, there were 54 percent in favor of stricter laws and 43 percent against. In March, the responses were back to where they were two years earlier: 52 percent in favor of stricter gun laws and 45 percent against. -- That Pew Research Center/USA Today polling done in July 2012 showed 46 percent of those surveyed believed it was more important to "protect the right to own guns" than it was to "control ownership." Forty seven percent said it was more important to control ownership than to protect the right to own guns. In February of this year, 46 percent said it was more important to protect gun owners' rights — no change from before the Newtown shootings. Fifty percent came down on the side of "control ownership" — almost no change from the previous polling when the margin of error is factored in. At least one response to one poll runs counter to the trend. An NBC News/Wall Street Journal survey has asked: "In general, do you feel that the laws covering the sale of firearms should be made more strict, less strict, or kept as they are now?" In January 2011, 52 percent said laws should be "more strict," 10 percent said "less strict" and 37 percent said they should be "kept as they are." The "more strict" response grew to 56 percent in January of this year and 61 percent in February. Meanwhile, the "less strict" response declined to 7 percent in January this year and 4 percent in February. Fewer people said laws should be "kept as they are": 35 percent agreed with that in January this year; 34 percent said that in February. President Obama, who will continue his push for stricter gun laws this week when he travels to Denver, last Thursday said Congress shouldn't "get squishy" on tightened gun laws. Speaking of the Newtown shootings, the president said "shame on us if we've forgotten."